We've had, right on schedule, our first snow fall for the incoming winter of 2011. It was much-overhyped as usual by the local weather guessers and the National Weather Service. Winter Warning....be scared, panic! As it is, it hit in the northern part of the state, caused power outages and some accidents but hardly lived up to the dire warnings issued beforehand. Heck, I rode Yoshie to work yesterday, all geared up and ready for bad road conditions and traffic. All I got was basically "fat rain" on the way to work, with snow falling nicely but melting instantly upon hitting the roadway. The snow was sticking to non-road surfaces and the falling snowflakes glittered quite nicely in one's headlights as I rode along but that's about it. Riding home yesterday from work, I was struck by how nice the fallen snow had made the trees along the route home. It was a wet snow and it clung to the leaves and branches quite nicely. Probably what caused all the power outages further north as power lines went down. So this morning I set off as dawn broke to try and get some pictures of snow-laden trees. Didn't really have much luck either due to the light angles or the fact the trees I sought had already shed the snow they'd accumulated! As you can see the roads are dry and clear, a few ice patches here and there where melting snow had re-frozen overnight. 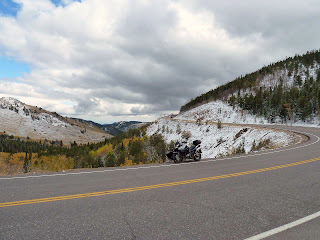 Temperatures during the ride were in the high teens, so my heated grips were running and my grip covers allowed me to ride with summer gloves on. 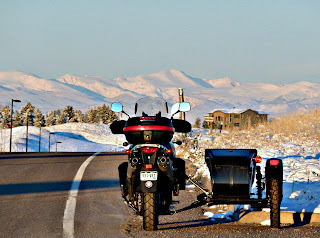 We'll lose all the snow in the city by the weekend, so folks around here should be able to get some riding in. 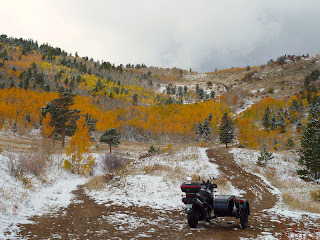 When I rode the Switzerland Trail the first time at the beginning of October, I failed to do realized at the time that I had ridden but a small portion of this trail. Today, I set out to remedy that situation. Got a late start but by 11:30 or so I had traversed the Denver Metro Area using the I-25 and US36 Slabs, getting on CO 119 as I exited the SW portion of the PRB or People's Republic of Boulder as it is locally known. 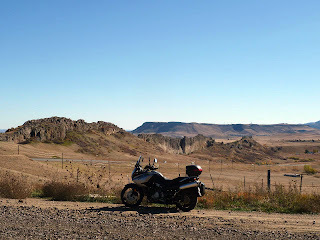 I took this to the turnoff for Sugar Loaf Mountain Road and soon found the next turnoff that would put me on the southern end of the Switzerland Trail. The trail is an old narrow-gauge railroad bed I am told. The condition of the trail is very rocky on long stretches, with lots of loose fist-sized sharp-edged rocks to make one's transit through them "interesting". I only grounded the rig once since I was taking it easy. Not much in the way of views as one is bordered by pine forests on both sides of the trail. 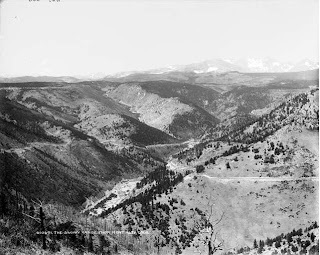 The trail is cut on the side of the mountains and it winds it's way northwards towards Left Hand Canyon Road or Boulder County Rd 118. I still managed to miss a small portion of the trail darn it. At its junction with Boulder County Rd 118, it splits off and heads northwards to CO 52 or Gold Hill Road. I turned westwards without noticing I'd left the Switzerland Trail and getting onto Left Hand Canyon Drive. 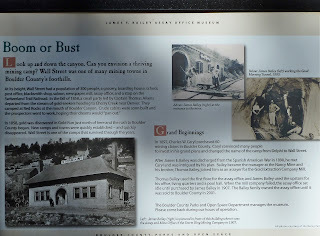 I ended up shortly at the old mining town of Wall Street. A bit of history on the town. Soon after Wall Street, I came to the junction of the road and Four Mile Canyon Road. 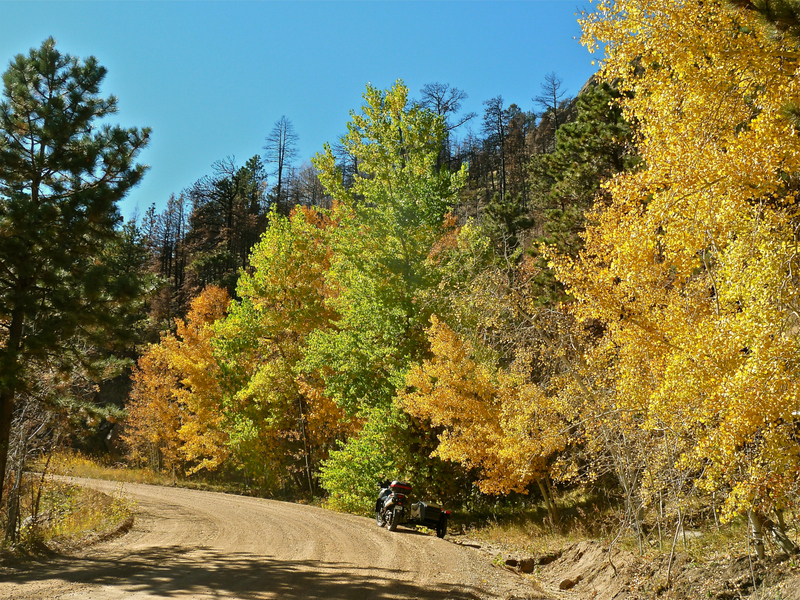 I turned left onto Four Mile Canyon Road and soon I was nearing the town of Gold Hill. 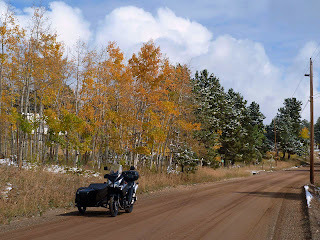 At Gold Hill, I kept on going north on CO Hwy 89 or Lickskillet Road. 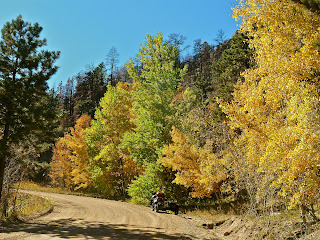 This is a very steep dirt road leading one down (swiftly) towards its junction with Left Hand Canyon Road. 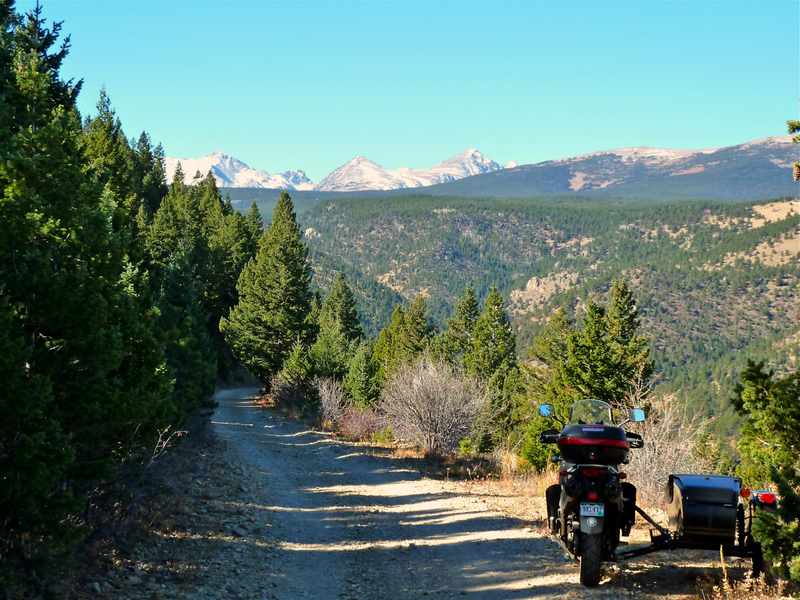 I turned towards Boulder at this point as I thought I'd completely covered the Switzerland Trail. I transited the PRB and took CO93 south towards Denver. 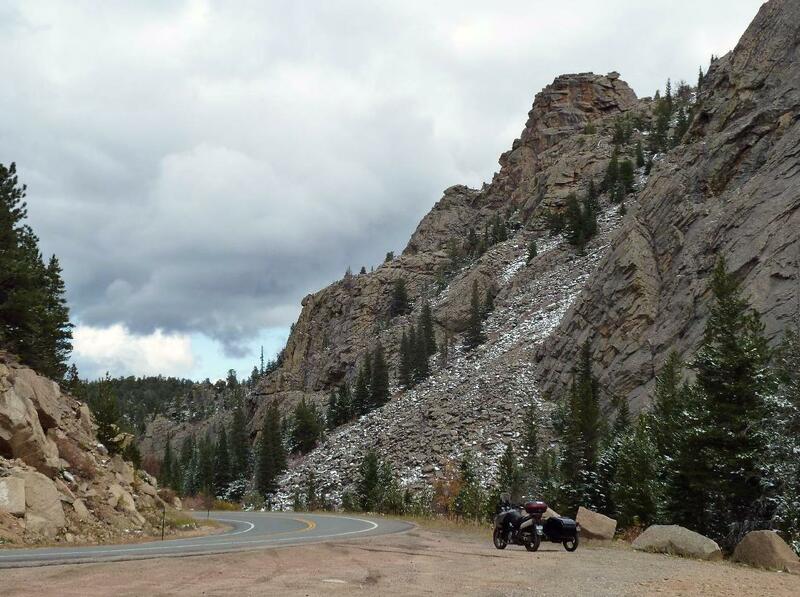 Just past the junction of CO93 and CO72 (Coal Creek Canyon Road), one can see a remarkable looking ridgeline of exposed rocks. I've tried several times to capture a good view of it and today was the day. I found a small driveway just off CO93 and ventured a bit into someone's driveway to get these shots. Got home by 3:30 PM, Yoshie continues to do great on these rides with no perceivable chain-stretching issues. 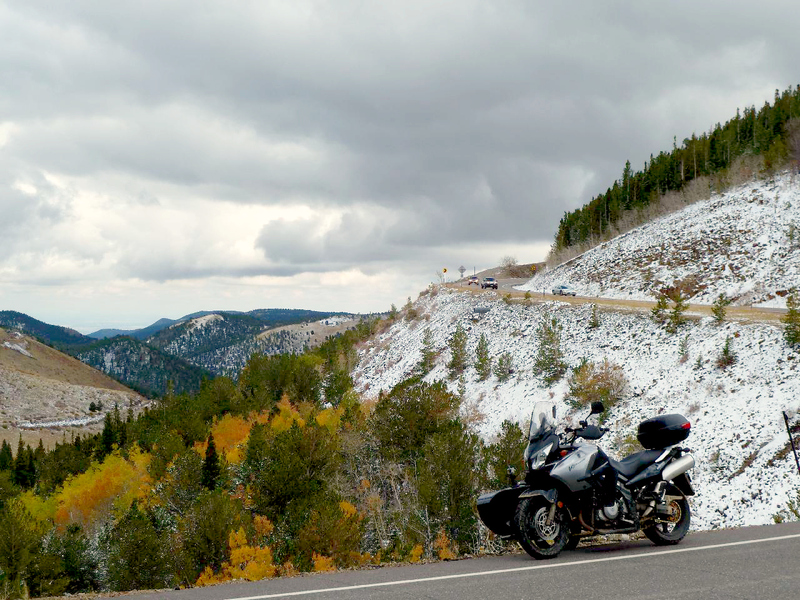 Snow is expected on Wednesday of this week, so if my fellow inhabitants of the Denver Metro Area didn't go riding this weekend, they might be out of luck for the near future. 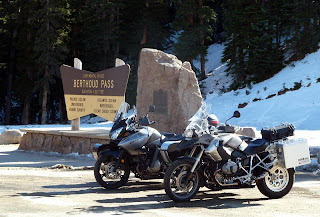 I recently met a fellow sidecar rider, Cesspool is his username on advrider.com, and he rides a beautiful BMW R1200GS mated to the same Dauntless M72D Dual Sport Sidecar that Yoshie has. Cesspool has been working diligently to "dial in" his rig so that it rides correct and with least amount of effort. The first time I saw his rig, something just didn't look right in the way it had been set up. Note: This posting was first published in my examiner.com byline, if you'd like to help my fuel budget, please go HERE and read the story there. Then come back here for the additional videos. Thanks. Much work since then, Cesspool aka Greg thought he had it pretty close. We arranged to meet in the town of Dumont, CO and from there ride out to the Rocky Mountain National Park on our rigs to see how his behaved. We met up around 9:30AM and after a brief chat, we moved on over to the nearby truck weigh station as Greg was curious to see what the weight readings were for his rig. He talked to the operator and he agreed to let us put our rigs through, no charge! Such a deal. station operator into letting us go through the scale. Between trucks, here's Greg easing his GS Rig onto the scale. His rig came out at 1160 lbs. Yoshie and I came in at 1020 lbs. Note: Greg was carrying 100lbs of ballast for this ride, I was not carrying ballast. Weighing operations done with, we headed west on the I-70 Slab until we got to the Empire/US 40 exit. Turning north on this road, we climbed upwards towards Berthoud Pass. Soon enough we were in the parking lot where the visitor center is for the pass and posed our rigs accordingly. Motoring onwards, we headed north to and through Winter Park and the towns of Fraser, Tabernash and Granby. 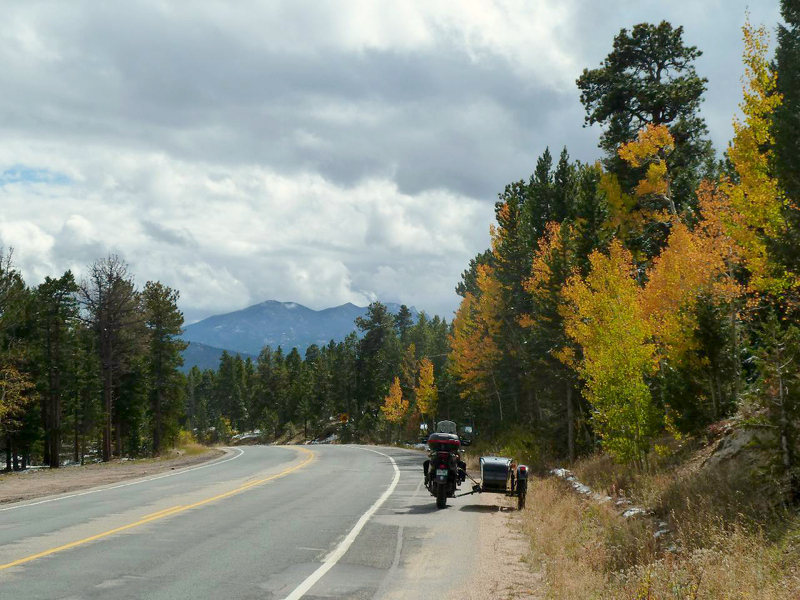 At Granby, we turned off of US40 and headed now northwards on US34 past Lake Granby, Shadow Mountain Lake and finally to the Grand Lake. 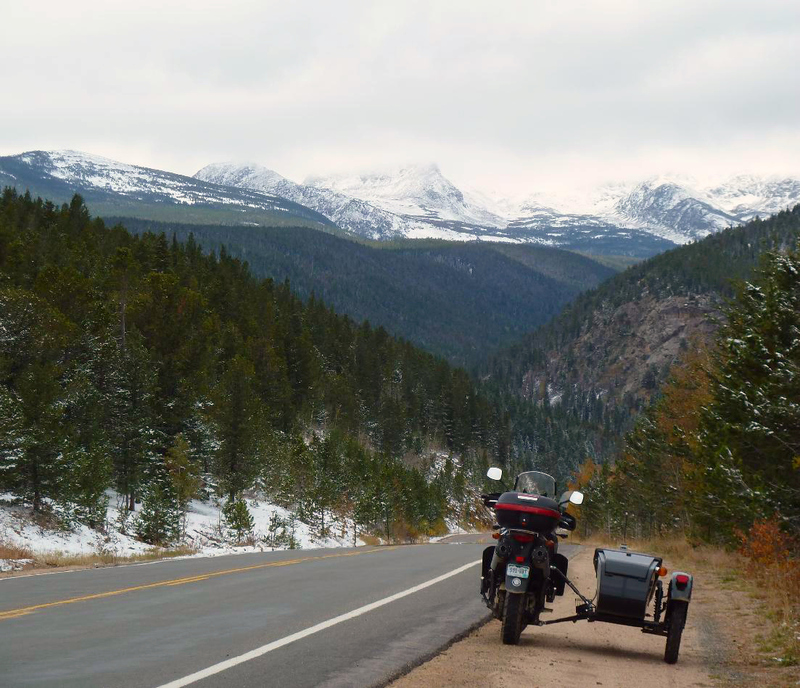 Soon after Grand Lake, one enters the Rocky Mountain National Park limits. 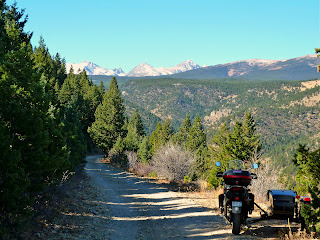 We each paid our fee of $10 for our motorcycles and headed on towards the nearby mountain peaks. Not sure what was going on with my camera but several shots I thought I took, didn't appear on the SD card in the camera. Rather disturbing that. I made poor Greg stop all those times, and not much to show for it! Weird. We rode the five hairpin turns and reached Milner Pass where once again we posed our rigs by the pass sign. 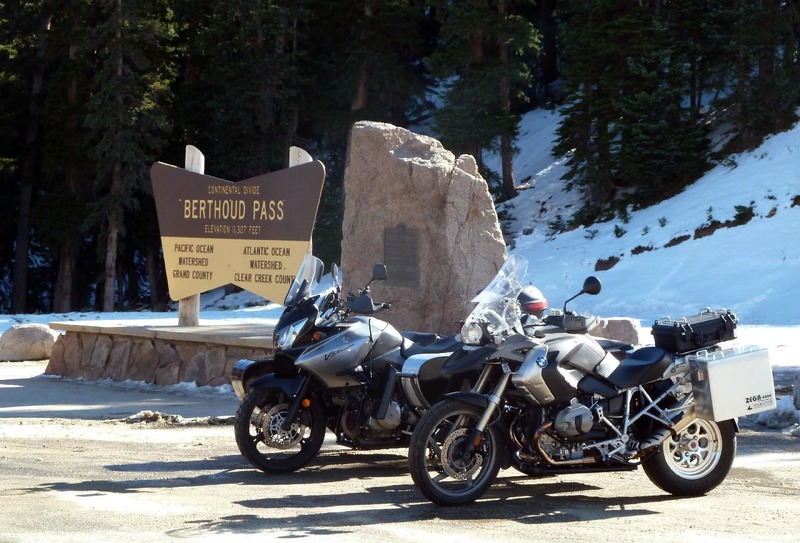 The ride up to the top of Trail Ridge Road was smooth and dry for the most part. Some snow has already started to accumulate alongside the road but not to any great extent. We stopped at the Alpine Visitor Center and I mounted the GoPro camera pointed rearwards so I could capture Greg and his rig as we rode on Trail Ridge Road. The weather was heavily overcast and gray. The wind was up and blowing but it was not very cold. Good riding weather, really. Pretty soon, we came to my favorite stopping point on Trail Ridge Road. 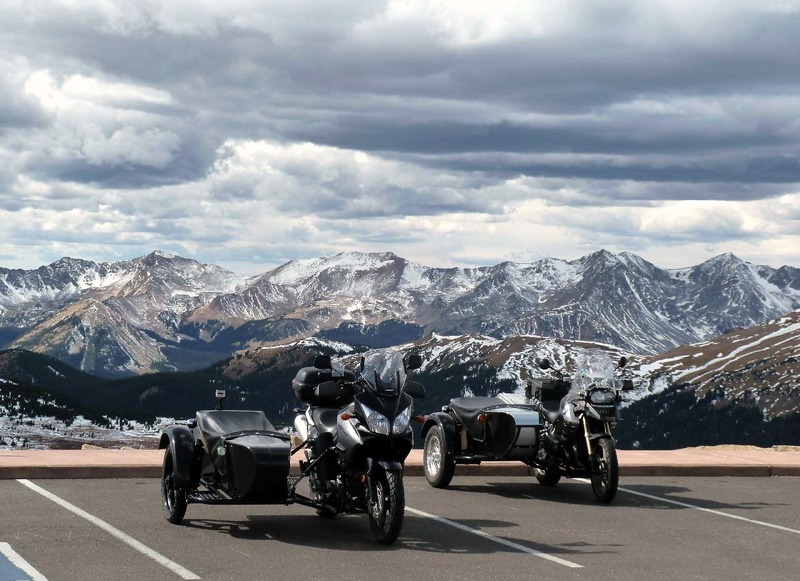 The "Rock Cut" is a parking area with great overlooks of the nearby mountain peaks. We continued eastwards on Trail Ridge Road, again I was shooting video of Greg as he rode along behind me on his rig. Too soon, we had ridden downwards enough that the scenery was mostly obscured by dense pine forests. You can see the ravages of the Pine Beetle though throughout the park, quite a shame really. 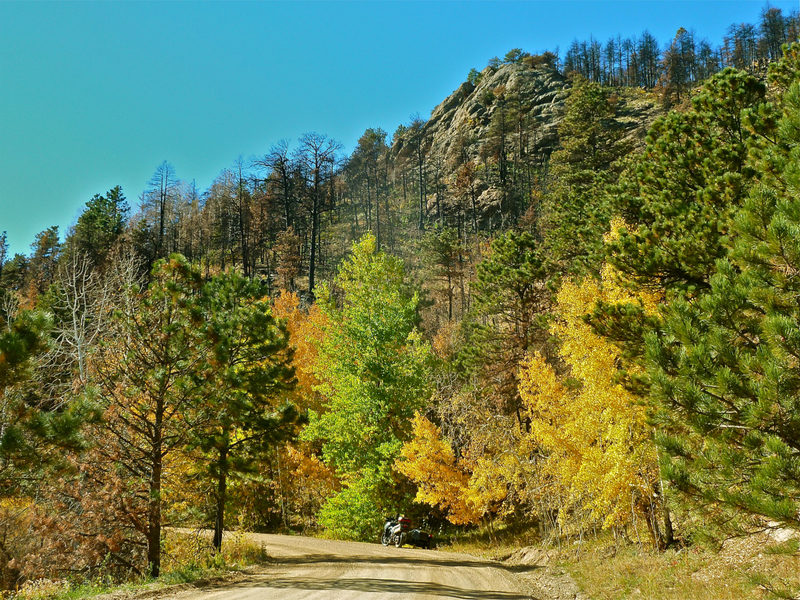 The beetle infestation has really taken a toll on the forests of Colorado. Once we were at the valley floor, Greg and I switched rigs so we each could get a taste of the other guy's rig and how they handled. I must say, Greg's GS is quite smooth and nice to ride. The muffler emitted a wonderful sound as I rode behind Greg on Yoshie. 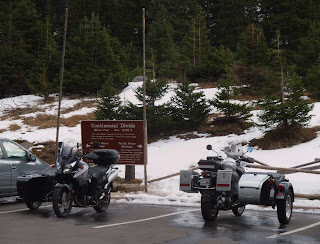 This was only for a very short ride and we ended up parking at the Beaver Meadows visitor center to exchange notes on the rigs. It was time to head home now and Greg led the way through the town of Estes Park which was crawling with tourists! We took US36 back towards Lyons, CO. 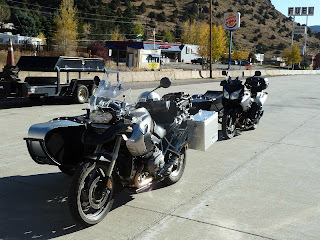 It was a nice and mellow ride on US36, both our rigs taking its twists and turns with no issues and easily keeping up with traffic for the most part. I turned south at the junction with where US66 and US36 separate in Lyons, I beeped my horn and waved goodbye to Greg as he continued on US66 towards Longmont, his home. I transited through the usual traffic jam that is Boulder and soon enough I was heading towards home. I experienced some delay as US270 was having construction work done and we had to take detours, but not a big deal. I sure am glad though, I don't work in that part of town! Got Yoshie home after 280 miles on her odometer, no mechanical issues and the chain seemed just fine when I checked it. Greg emailed me earlier this evening and told me he'd adjusted what we both thought was excessive toe-in on his rig. Sounds like more riding is in store to further "sort out" his rig. It rides fine, both of us thought so, but there was some effort involved when turning her to the right, this toe-in adjustment should do the trick. 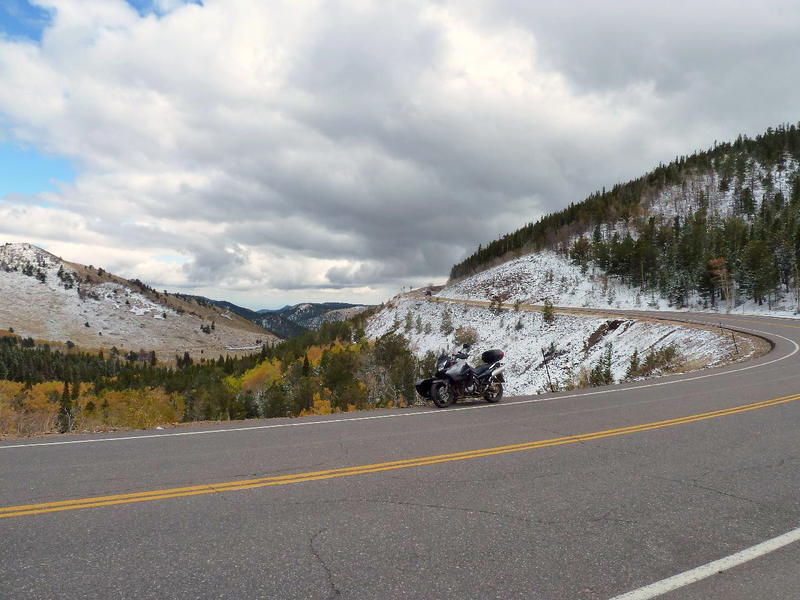 Note: Just got an email from CDOT, Trail Ridge Road is closed due to adverse weather conditions. I guess those clouds you see on the videos weren't kidding huh? To the east of where I live, there are rolling, windswept grassy plains which pretty much describes eastern Colorado's terrain features. 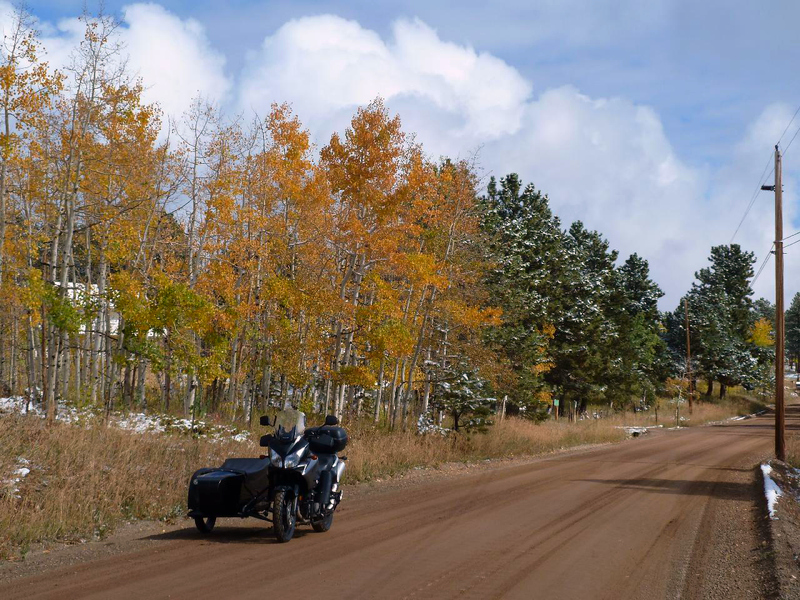 Straight county roads, allow one to ride along with minimal steering attention required, and allow one's mind to unwind from the weekly issues. 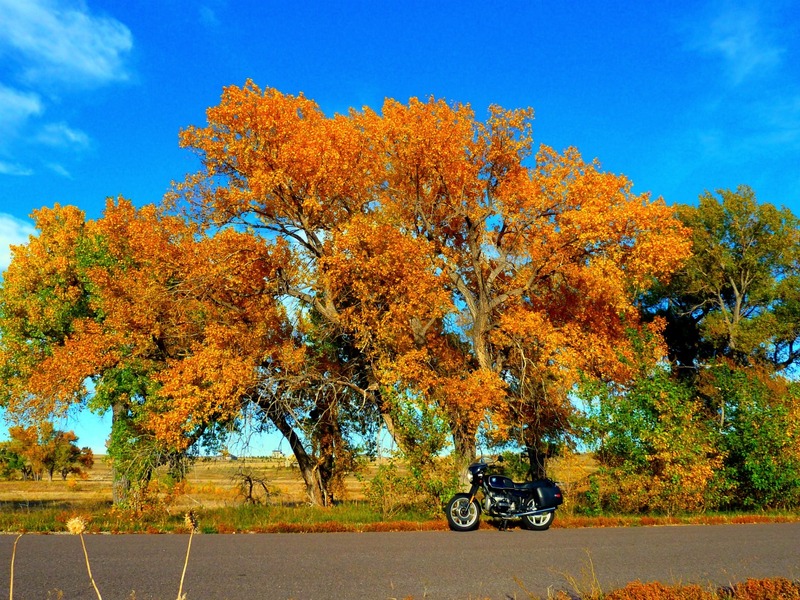 Nothing to think about but the purring of one's motorcycle engine, feeling the wind hitting you gently and enjoying the smoothness of the road. 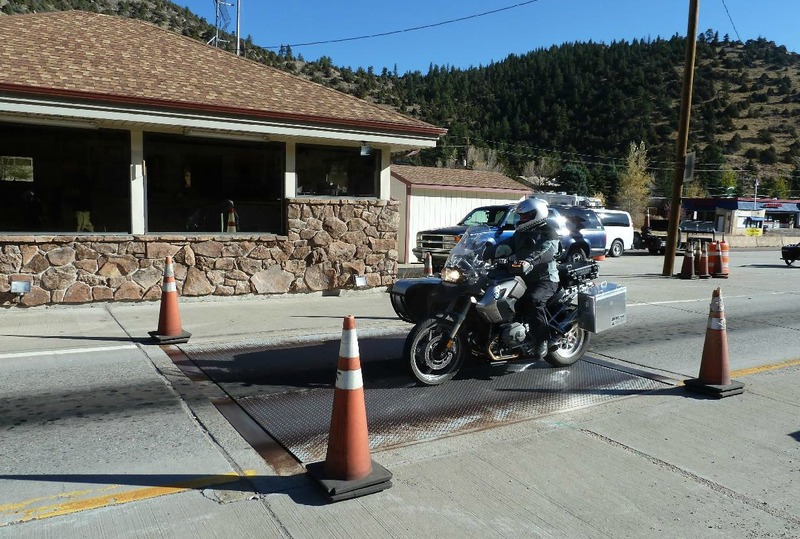 I saw a sign for a housing development called Elkhorn Ranch and turned onto the paved road leading into it in a winding manner which motorcyclists find attractive. The houses are of the McMansion size and the signs said they came with five acres of land. No trees mind you as these are the eastern plains but if windswept grassy plains are your thing, you should check it out. 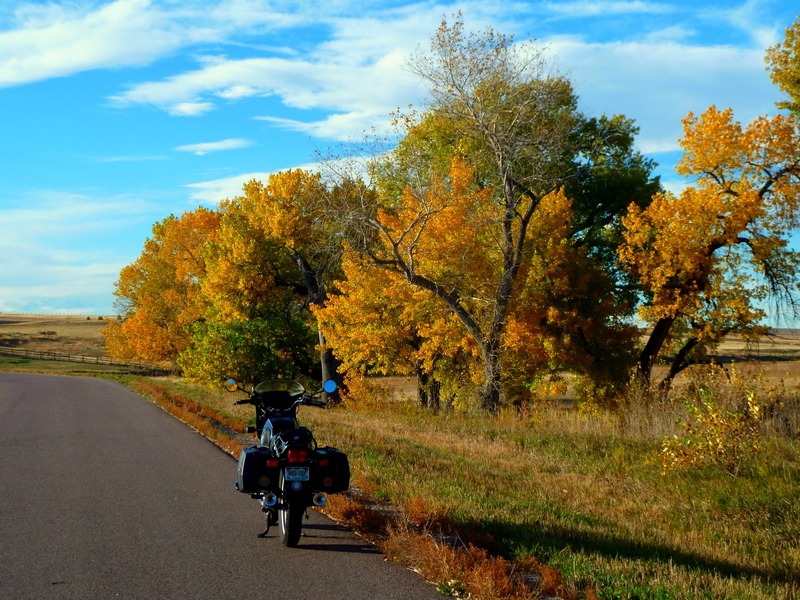 I wandered about, letting the road take me where it would, just enjoying the views of the distant front range mountains and the warm temperatures brought along by the gentle winds. I spotted a grove of trees at one point which were in the process of changing into their fall colors and stopped Brigitta for pictures. I am on call for work this weekend, so this was a short ride. Too soon, I was back home. Hopefully, I'll be able to arrange for a co-worker to "cover for me" tomorrow for a longer ride. 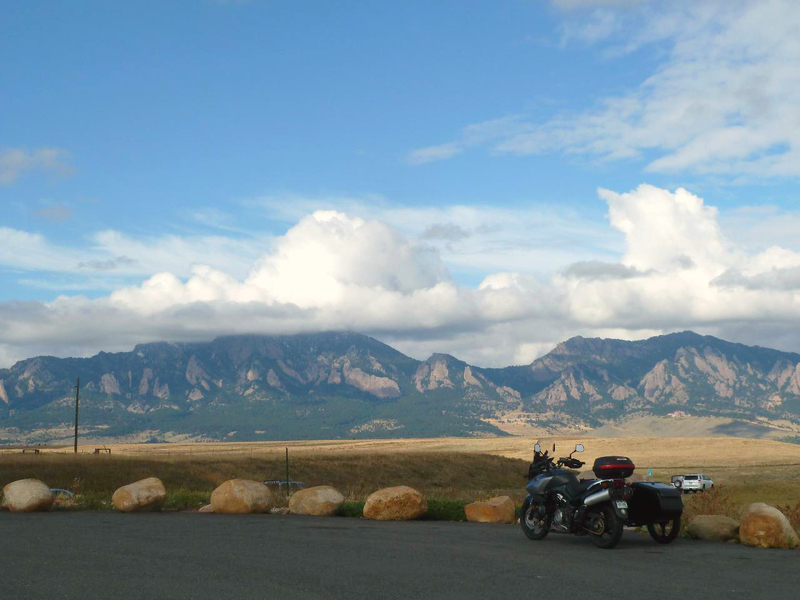 I left the house by 9:00 AM and by 10:30 I was cruising slowly through the historic town of Gold Hill, near the city of Boulder. You get to the town by way of Four Mile Canyon and turn off on Gold Hill Road to access this old but yet populated town. 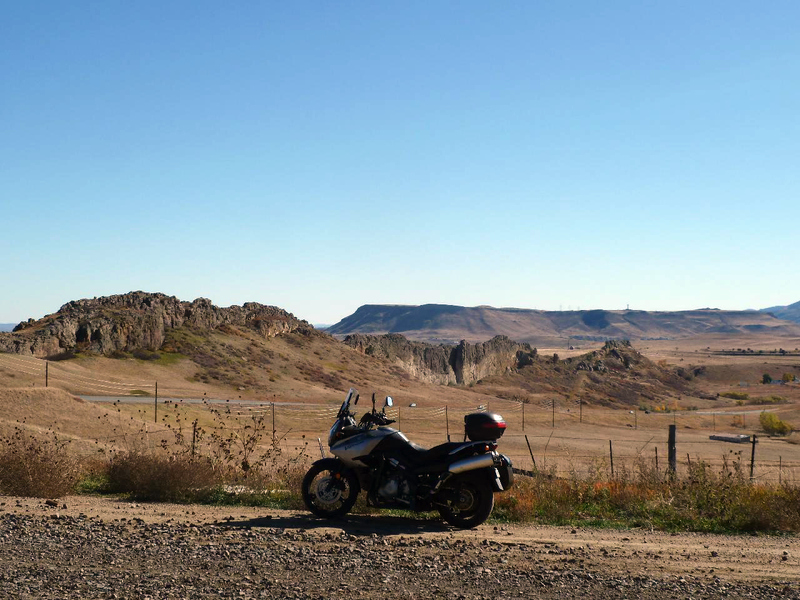 After a few miles, I was at the turnoff for the Switzerland Trail. It looked a bit ominous with snow covering its surface but I saw tire tracks on it so figured if a car could go across, so could my rig! I will admit, once I saw the car tracks dissapear, there was some "trepidation" on my part as to continuing onwards without a Uralista or two going along for "backup". I decided to chance it and motored on. portions of the trail proved quite doable so long as one didn't "gun"
the engine too much or lose forward momentum. the tug would break loose and swing left. I had thought, at the start of this trail, that it would junction with CO72, the Peak to Peak Highway and not force me to backtrack. Well, this was not to be as you can see in the video. I hit a dead-end and the only other path was up a very steep hill with an outlet in doubt even if I got up to the top. 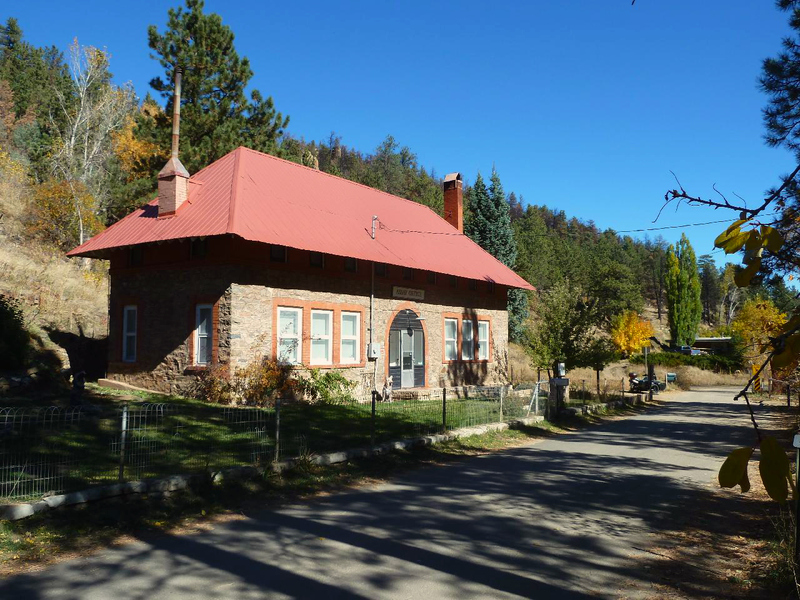 I rode northwards on Left Hand Canyon Road until it delivered me into the small mountain town of Ward and its junction with CO Highway 72, aka the Peak to Peak Highway. I rode until I got to the hairpin turn area near Peaceful Valley, turning around at the large rock formation just north of the Peaceful Valley Ranch. 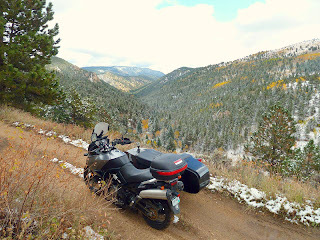 A quick consult of the map led me to turn Yoshie around and head instead south towards the town of Nederland. also liked the "threatening" look in the clouds above. The rest of the ride was pretty unremarkable, not too chilly but I was ready to head back down into the warmer Front Range area. I must have seen a handful of motorcyclists enjoying the views with me in the mountains. There were more riders in the metro area of course, out enjoying a warmish day before the next snow storm I guess. I got home around 3:30 PM, and happy once more to report Yoshie and her drive chain did just fine. Highway speeds, dirt roads, canyon twists and turns, and it was all good. We, in my experience, here in the Denver Metro Area, don't usually get our first snow fall till about the third week in October. Today we woke to rain which turned to wet snow. It was melting almost immediately as it hit the streets of my neighborhood but in areas with heavier snow fall, it was collecting on the road, as slush. 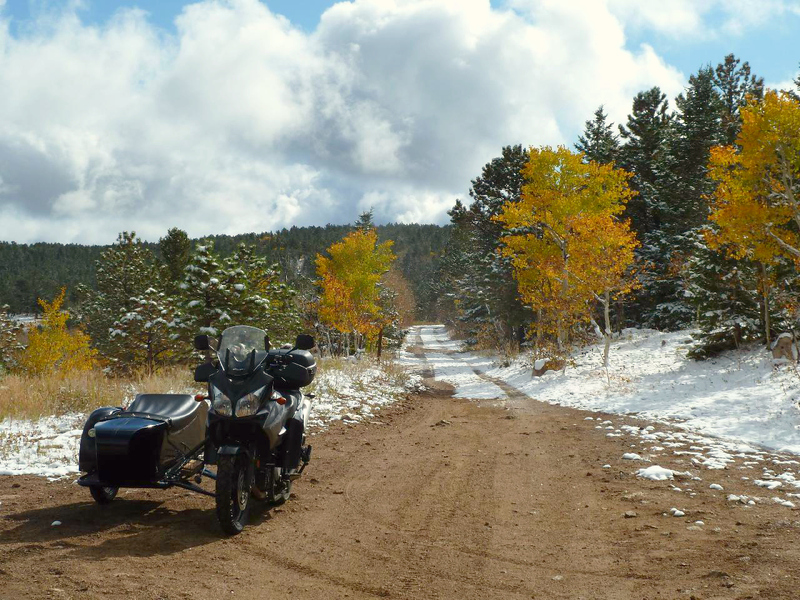 Needless to say, I rode out on Yoshie, my Suzuki V-Strom/Dauntless Sidecar Rig to see how she'd do in the stuff! 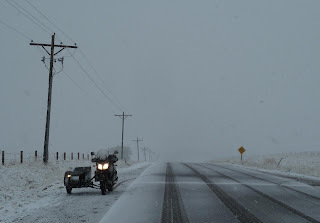 I layered up and rode into pretty heavy snow falling, it was melting fast but still caused me vision issues as I'd forgotten to swap in my visor with the fog shield. Still, quite the enjoyable ride. I got onto Quincy Road and rode it out east to the road which leads one to the Youth Correctional Facility. 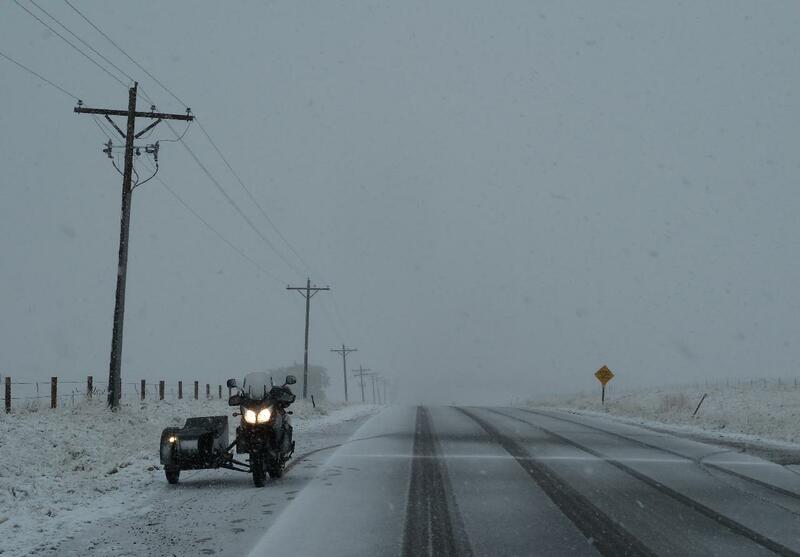 As you can see, not much accumulation so not much of a test of the tires and the rig itself. I am hoping more snow will come throughout the day and actually build up as snow, not slush. I now have the fogshield visor on my helmet, a fresh coat of pledge on the outside of said visor. My cold weather gloves are drying and it's 34°F outside. Let it snow, let it snow, let it snow. I've done my share of research on the proper way to mate and then align a sidecar onto one's tug. Today though I found a video link on advrider.com produced by adventuresidecar. 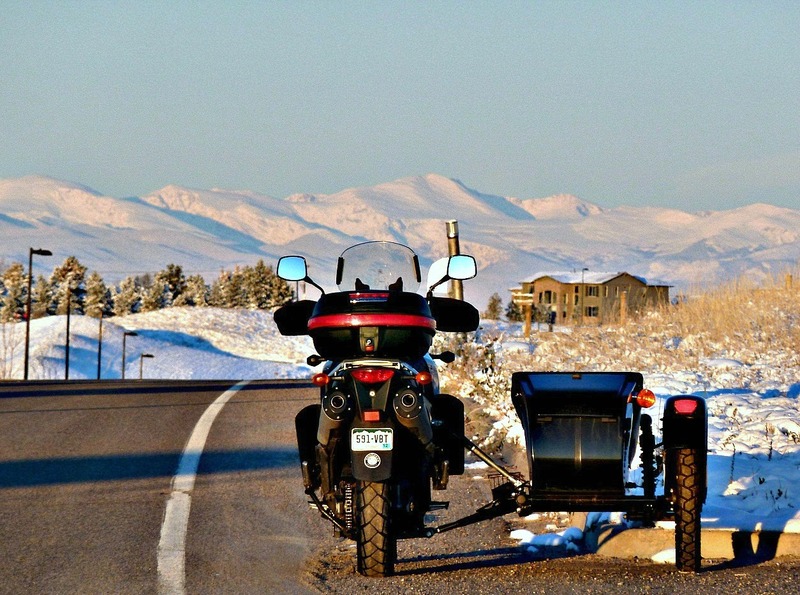 They're a training outfit in Oregon who provide training and tours for sidecar riders. I'd recently replaced my sidecar tire with a slightly thinner Kinsho 705 110/80R19 tire. The OEM one has been a Shinko Tourmaster 110/90R19. After viewing the video this evening, I re-measured my sidecar's lean-out and toe-in again and found that my lean-in was fine but my toe-in was too much! Figure some error on my part last time I did things and a thinner tire and I was at 1.5" toe-in. Too much, the guideline is 1/2 to 5/8 inch toe-in. 12 turns out later on the front lower A-arm support and I got it down to 5/8" toe-in as recommended. A short test drive later, she felt great in terms of handling and I think there was less effort in terms of keeping her going straight when at speeds above 60 mph. Before, I would have to push slightly to compensate for what I thought was wind drag on the sidecar, now am pretty sure the toe-in was "off". We'll see, need to give it some time to ride some more, get some extended time at the controls, and check the wear pattern on the tires. I recently also had to "adjust" the new chain by turning the tensioner screws out by 1/2 turn as the chain has loosened a "tad". Hopefully, that's the last adjustment for a long while. I am thinking this is the "initial stretch" new chains go through when first installed. Anyways, here's the video from adventure sidecar that I found so helpful, it sure explains how to do the alignment in an easy manner. 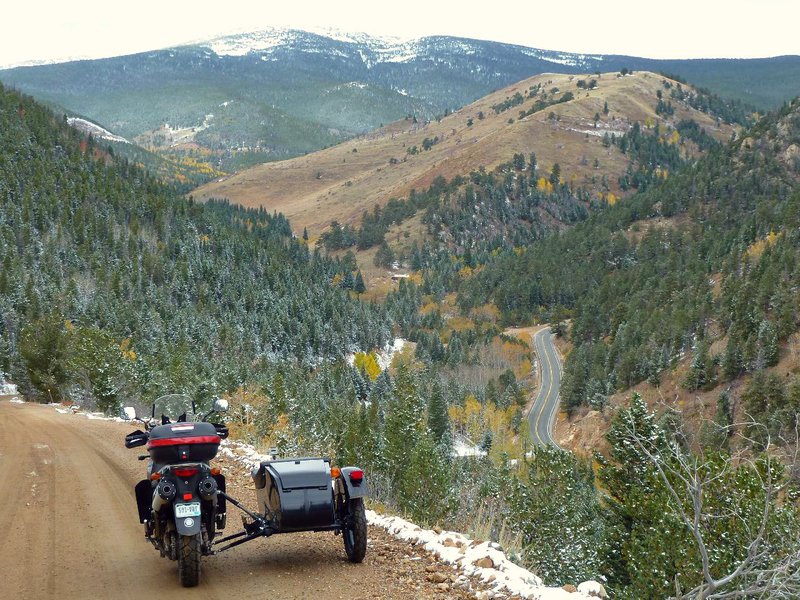 Sidecar Alignment from Adventure Sidecar on Vimeo. I hope fellow sidecarists find the above video as helpful as I did. Check your alignment!